When I was a little girl my Granny had a nursery chair, it was just little-girl sized and I can remember it being covered in a flowery (I think it was blue and cream) fabric. 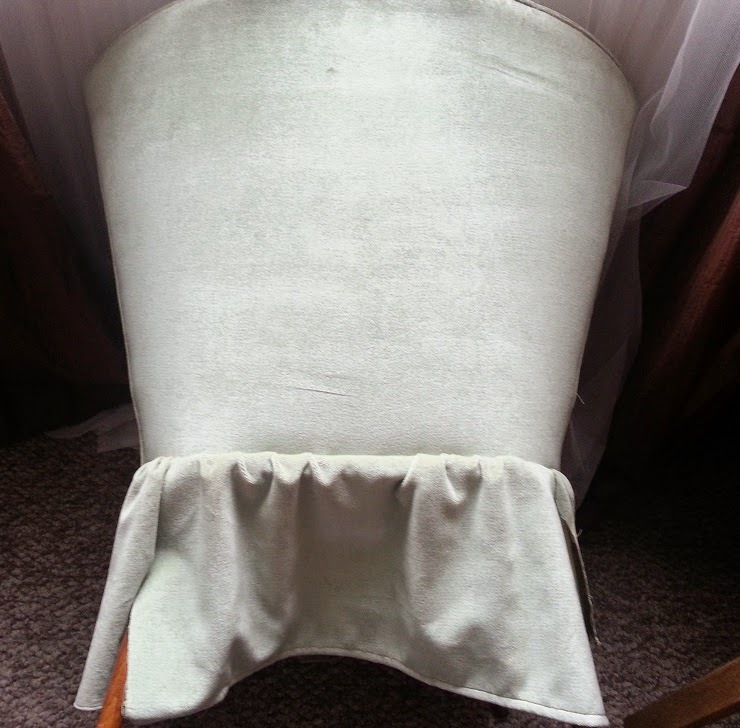 it was my absolutely favourite chair at Granny's and I got quite upset if one of my big brothers wanted to sit on it. A few years ago, when Granny moved and unfortunately had to get rid of most of her furniture, I asked if I could have the chair and the answer was yes! 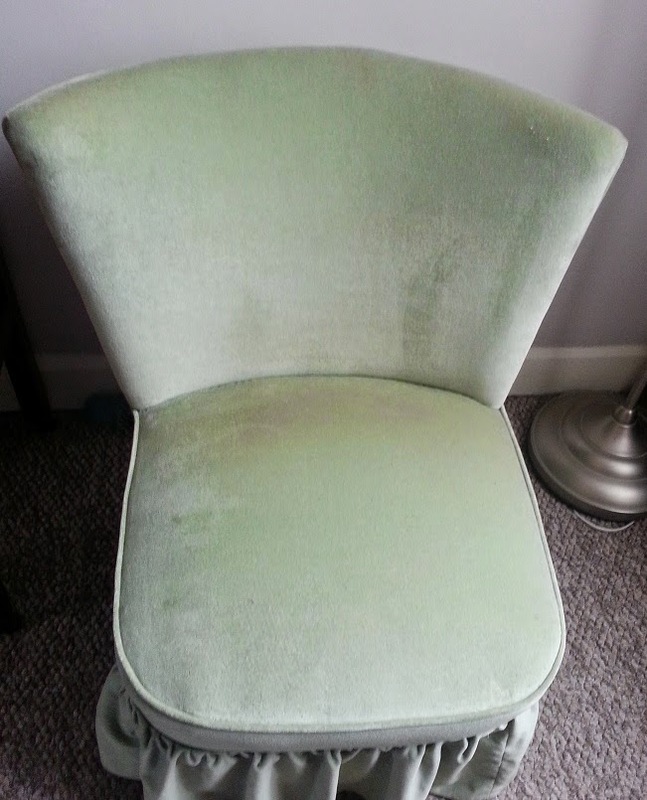 At some point in its history the chair has been reupholstered with a not so pretty pale green velour fabric, not my cup of tea at all. So it has been sat in the spare room while I work out what to do with it. 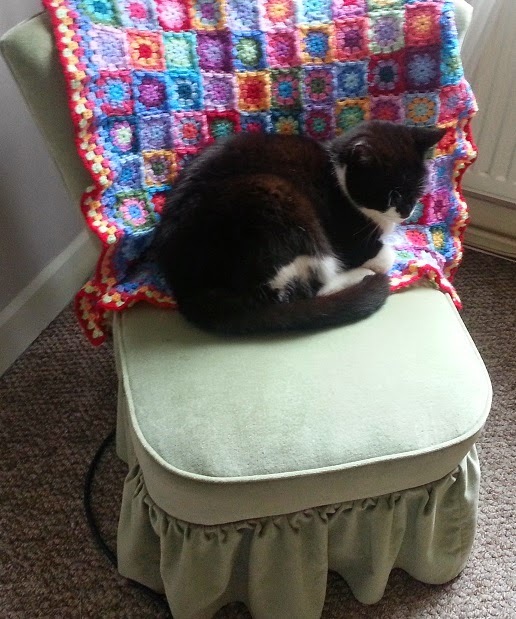 I made a flower throw a couple of years ago and chucked it over the chair, the cat was happy about that as he seems to have adopted it as one of his favourite napping places. It has been in the back of my mind for a while now, what am I going to do with it? I had thought about reupholstering it with fabric, or maybe making a loose cover for it in patchwork if I could manage it. One thing I am sure of is that the frill around the bottom just has to go! You know where this is going don't you? 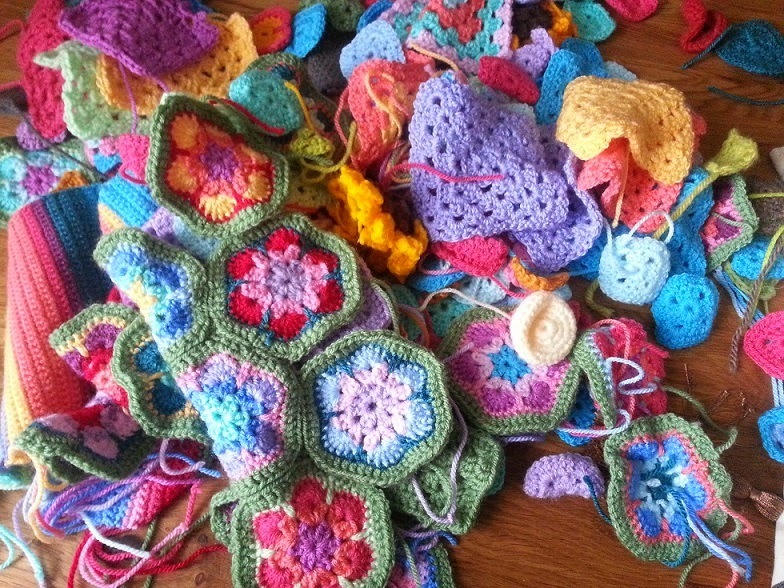 Yes, I am going to yarn-bomb it! But so many ideas, which to pick and where to start? 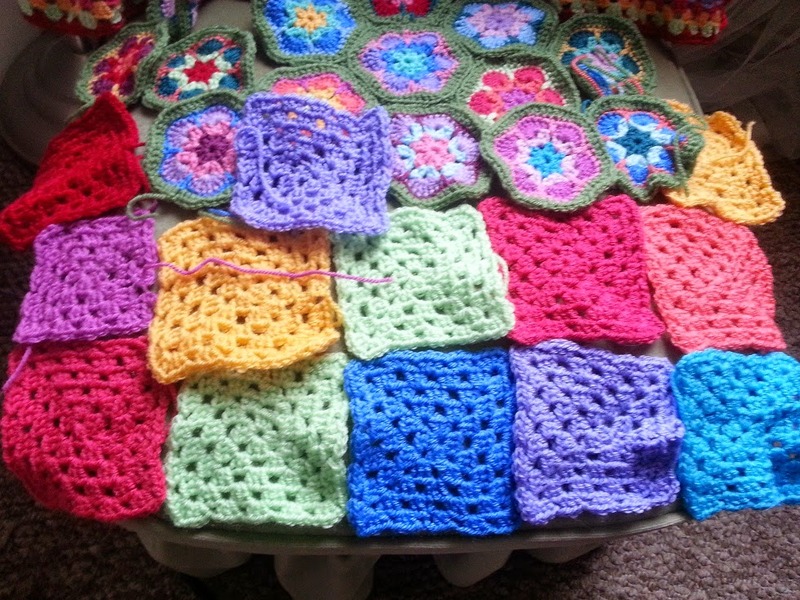 Left over granny squares, African flowers (that never ended up being a cushion) and dinky squares (meant for the same purpose). 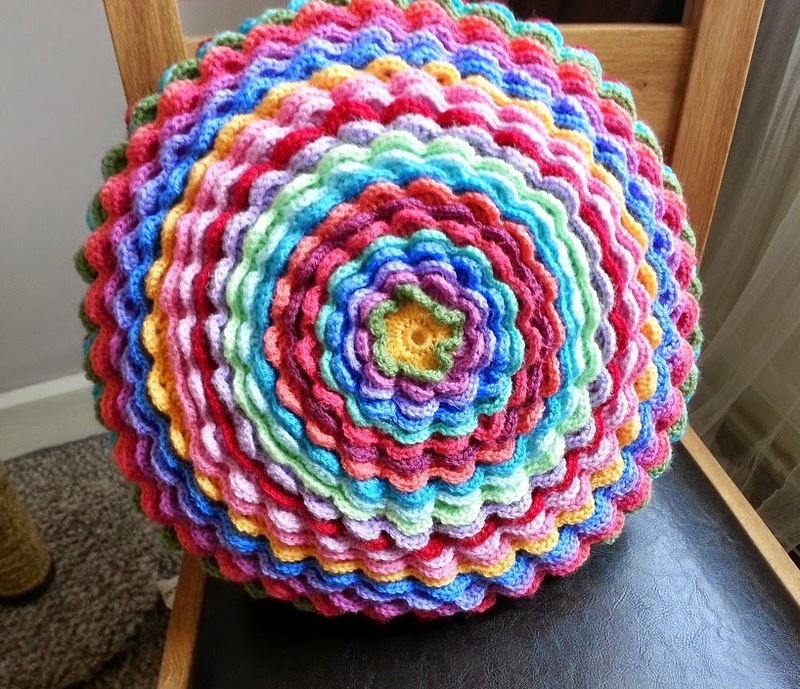 I don't want it to be too garish, it may well end up in the corner of the dining room and I want it to be eye catching because it is pretty and brightens up the room, not dazzle people with a mess of colour - there are plenty of other crocheted bits lying around that do that! Hmmmm. 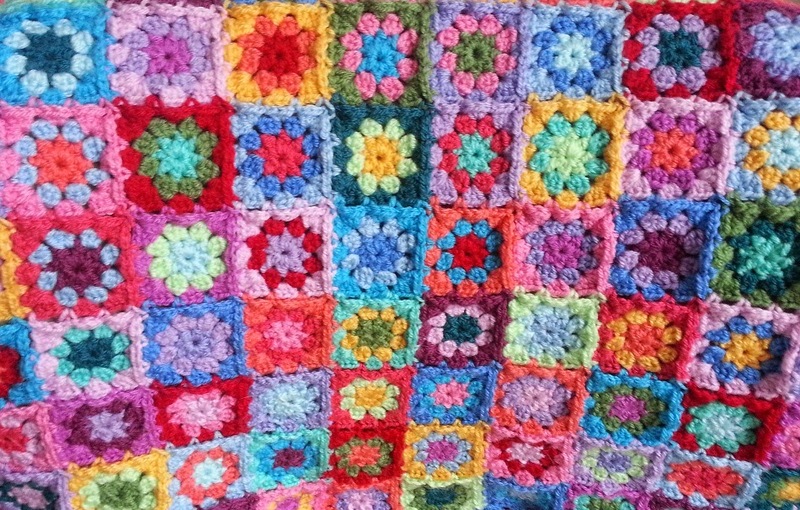 Modified one colour Granny squares, patchwork effect maybe? It will have to be a loose cover somehow so I can take it off and wash it, the cat really does love this chair. It had been downstairs all of 5 minutes and look! Hello my friends! 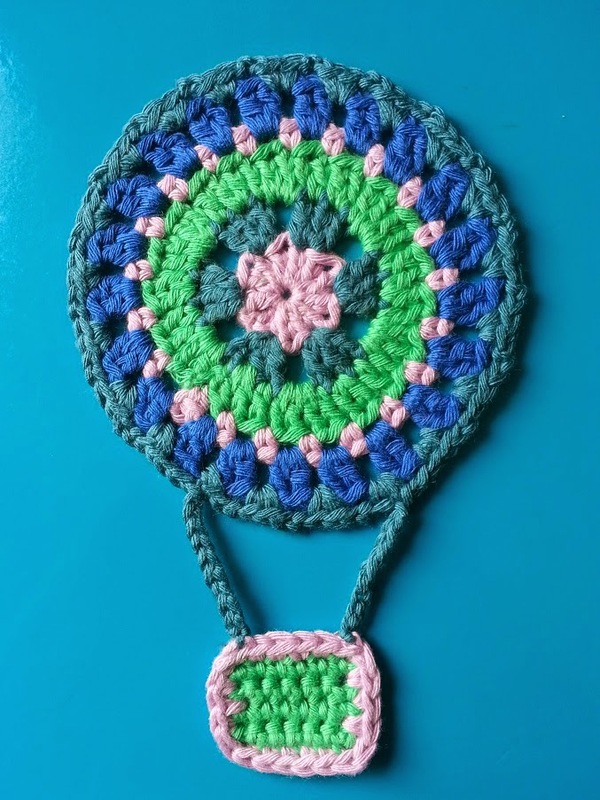 I am really giddy about this, I have a new pattern for you that I wrote this morning for (what I am calling) my Hot Air Balloon Mandala! 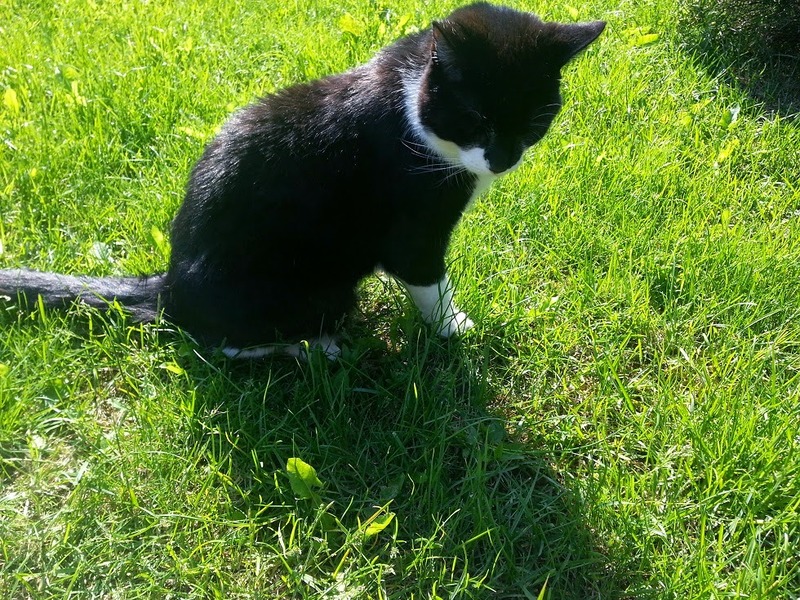 Unfortunately my cat decided to pull it all out last night (I suppose it beats him going out hunting and bringing us 'presents'). 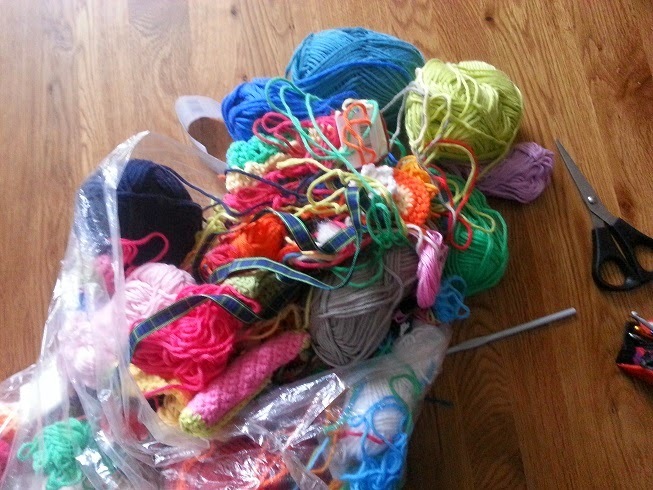 I could put it off no longer and this morning I set to sorting it out, just one or two tangles! 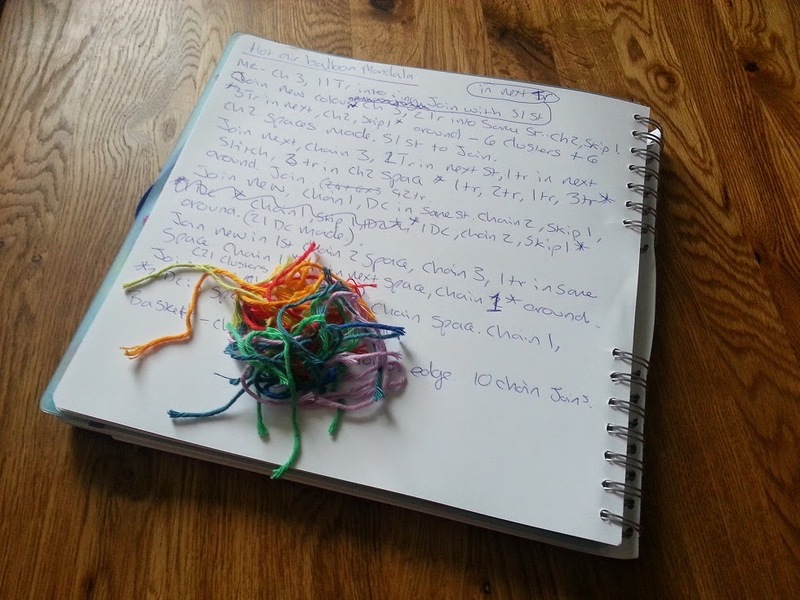 I was trying to unknot, detangle and generally sort it all out and my mind started wandering to things I have made with this bright and cheerful yarn. 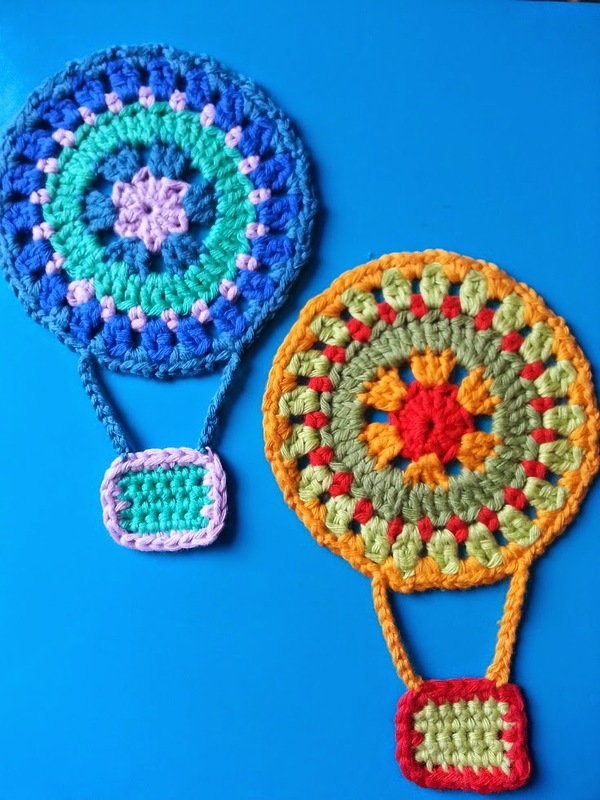 Bunting, mandalas, hot air balloons and inspiration hit! 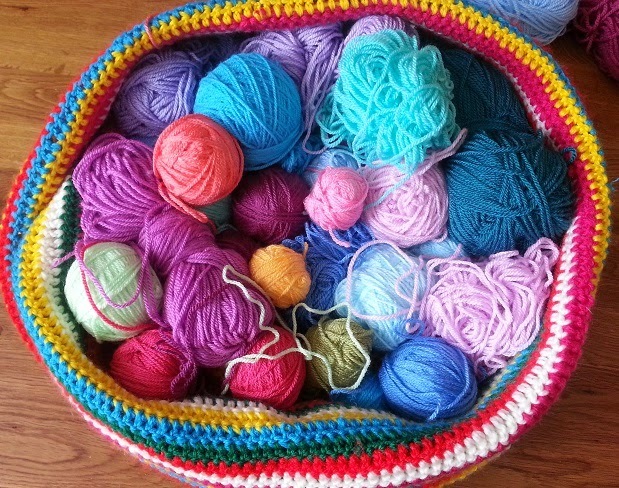 Who needs a tidy bag of yarn anyway? 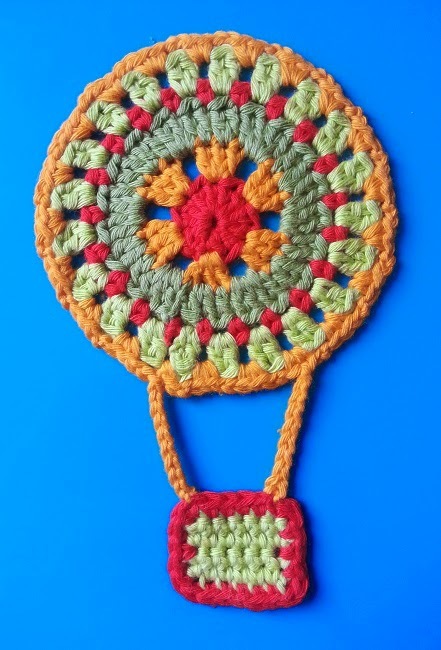 I started scribbling down an idea, then started hooking it up and before I knew it I had made a Hot Air Balloon Mandala, just ripe for stringing together as bunting. And I LOVE it!!! 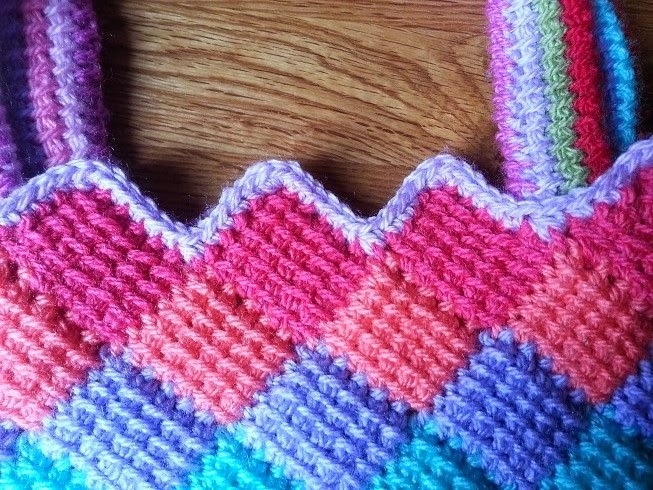 The pattern worked, Just a couple of little tweaks where what I had written didn't match what I had made, but pretty much spot on! Do you like them? I do, so much! 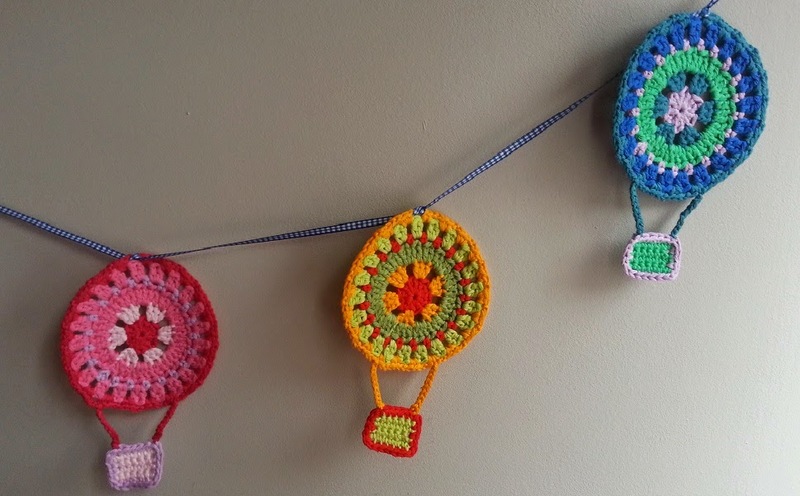 I thought about writing the pattern up as a picture tutorial but after three days of non-stop-crocheting over the bank holiday my eyes have pretty much given up, so I think I need a crochet-rest for a few hours. 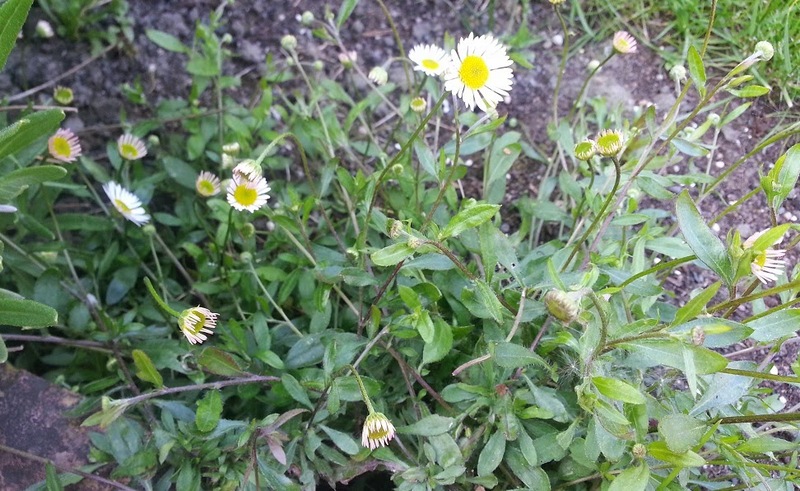 The written pattern can be found here. Yesterday I was having a play with my Rico Creative Cotton, enjoying all the bright colours and seeing what shapes I could come up with. 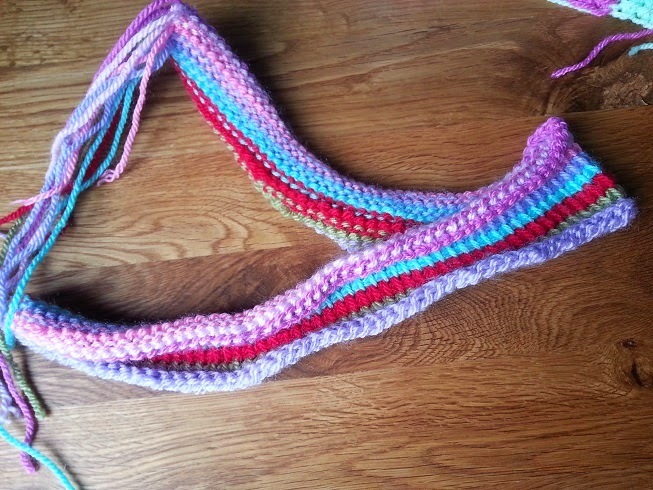 I know I have said it before but it is so much fun just playing with yarn! The brighter the better. 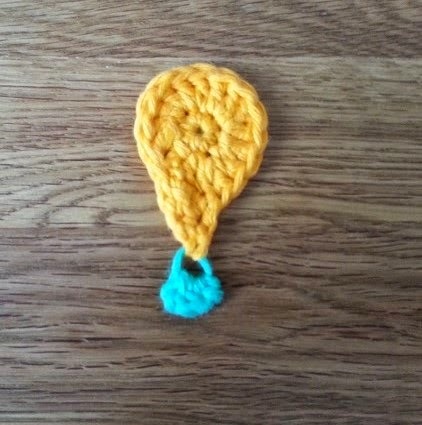 I came up with the shape of a Hot Air Balloon and before I knew it I had made several of them. I do enjoy being creative and making things up but I also love getting lost in a pattern, something with a good repeat that doesn't require too much concentration. 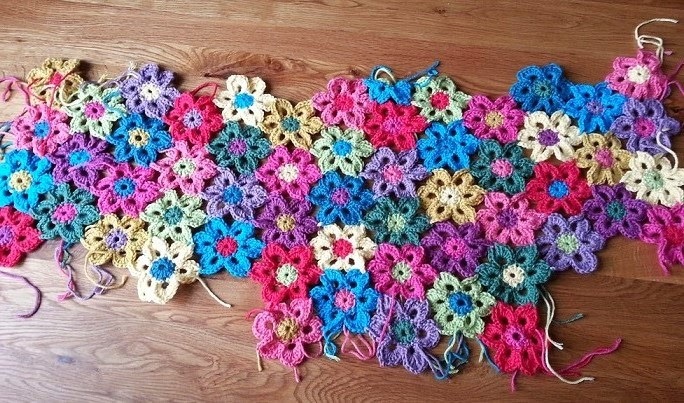 At a loss for what to do I remembered my long neglected flower shawl! I had almost forgotten how pretty it is! Not sure I like the look of all those ends to sew in, I still haven't learnt my lesson and will no doubt leave the majority until I've finished the flowers, I will worry about that then! I have still got a long way to go with this shawl, but it is a lovely thing to work on and when I actually get on with it it seems to grow quickly too. 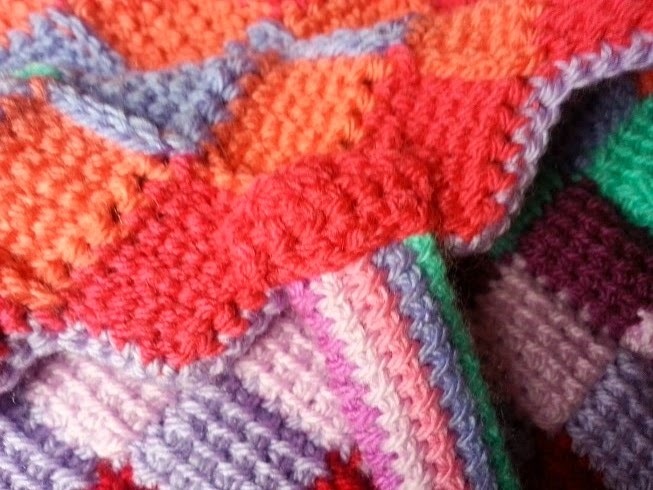 Between making Hot Air Balloons and flowers I am still busily working on some entrelac designs (Pixie Mitt number 2 is coming along nicely!) 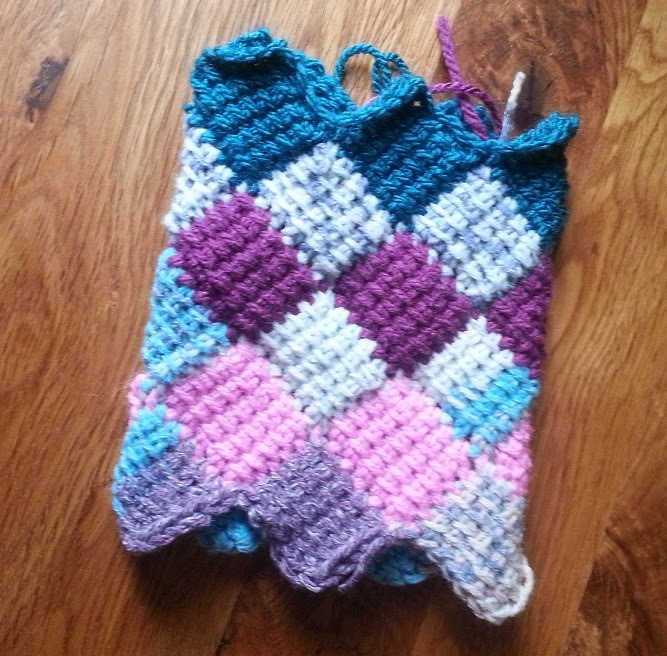 and having fun with Tunisian crochet. 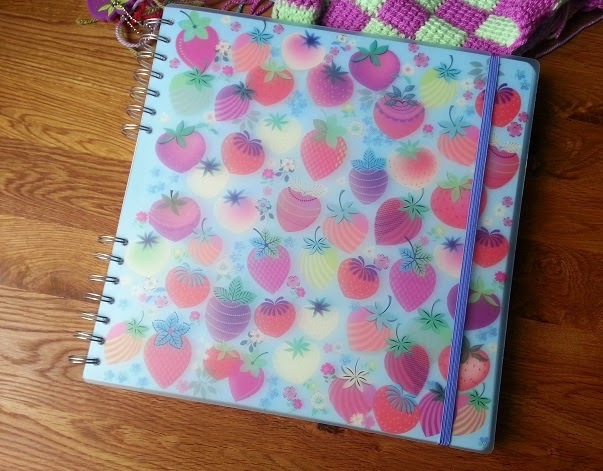 I am also really trying to take notes as I go so hopefully writing up the pattern won't be too difficult. 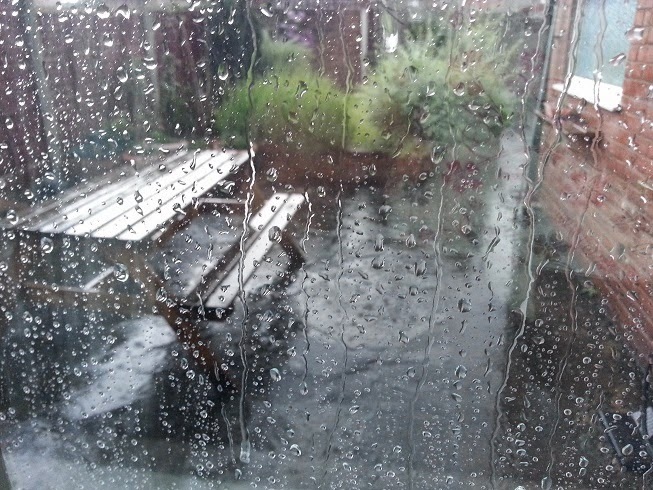 Apart from getting caught in the downpour yesterday on my way to the wool shop I have managed to stay nice and dry at home, catching up on some much needed housework and of course, crocheting. 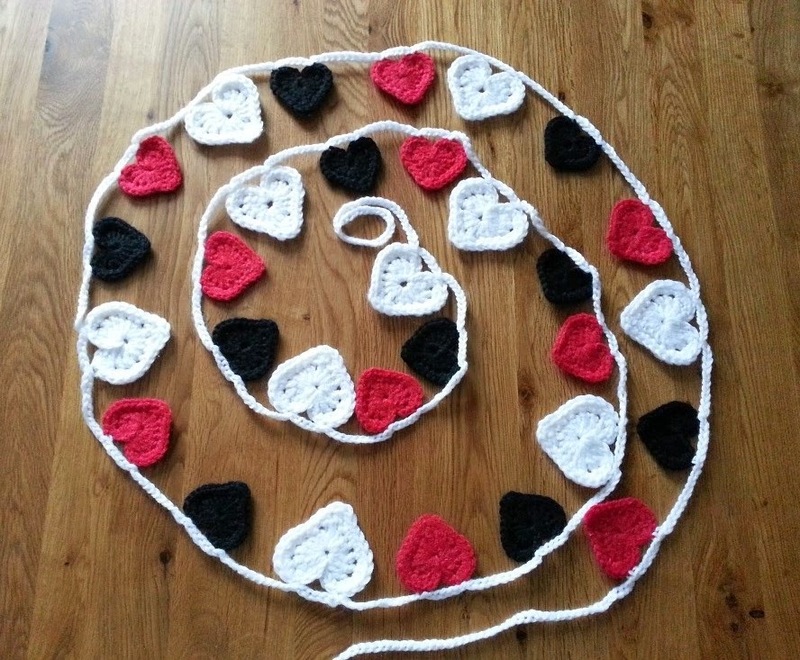 I strung them together with a long chain, putting a slip stitch into the top of each side of each heart. Ooh I do like them! I especially like how the different weight yarns have made them different sizes, a happy side effect of me not having any white double knit and the only red I could find was aran. 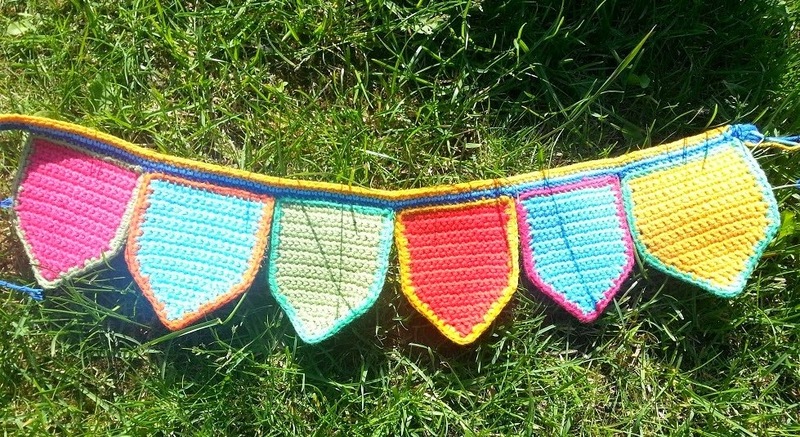 I seem to be going through a bit of a bunting phase at the moment. 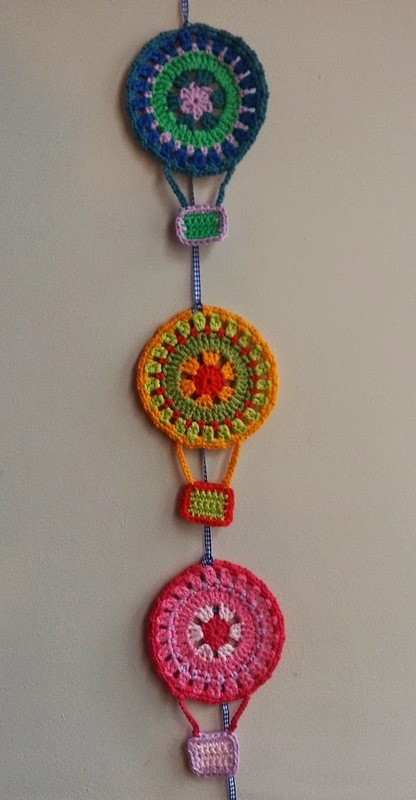 I am happy to say that the baby bunting I made arrived safely and that Baby's mum is very good with a camera (much better than me) so I have pinched this picture from her, lovely! 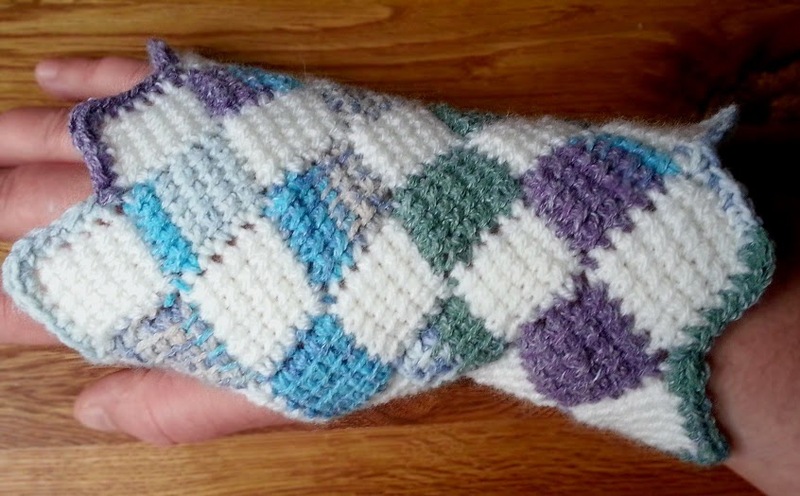 Bunting aside, I have also been getting busy with some entrelac and this morning finished what I am calling my Pixie Mitts! I'm not sure why I am calling them Pixie Mitts, I think it's this purply/green Sirdar crofter yarn that I am using and the zig-zaggy ends. And in truth I haven't made two of them yet, this first one was made up as I went so for the second I am going to try very hard to take good notes while I make it. 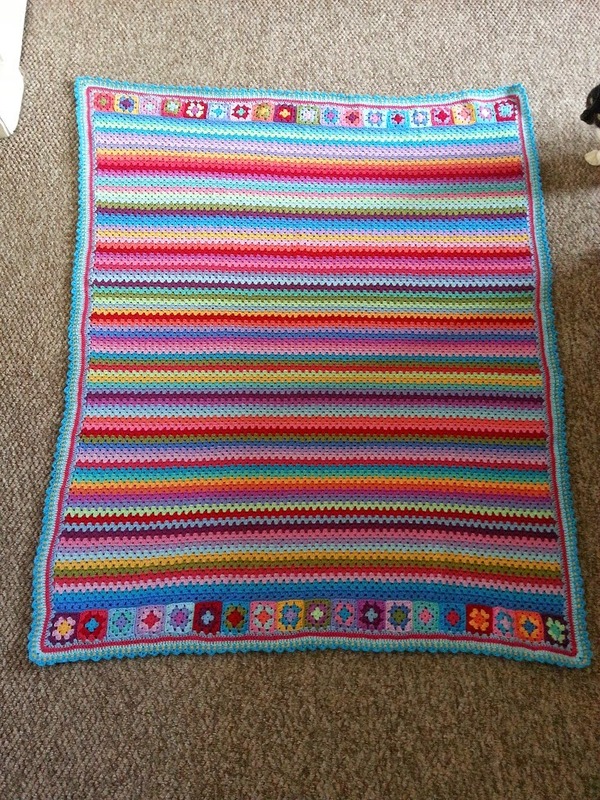 It was such fun to make! 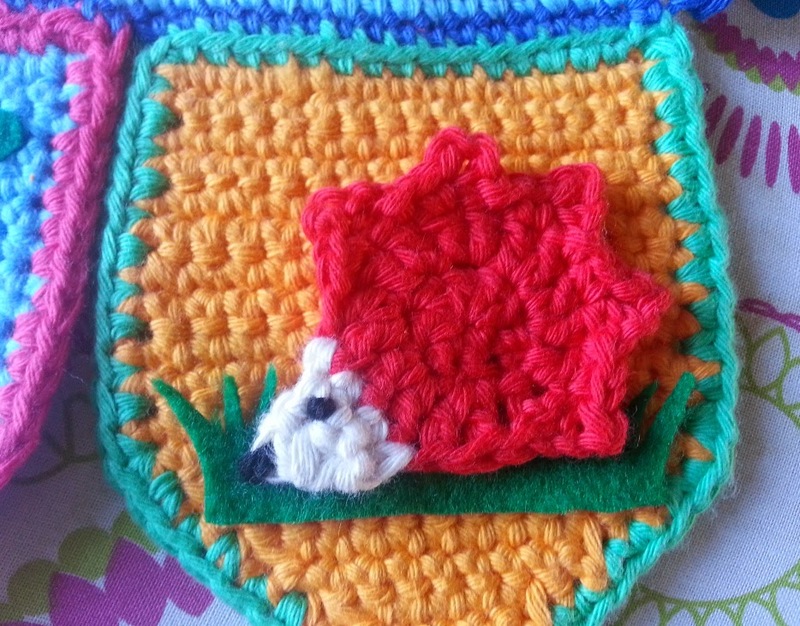 I decided to make it in the round so the only sewing was the few ends from the colour changes, excellent. 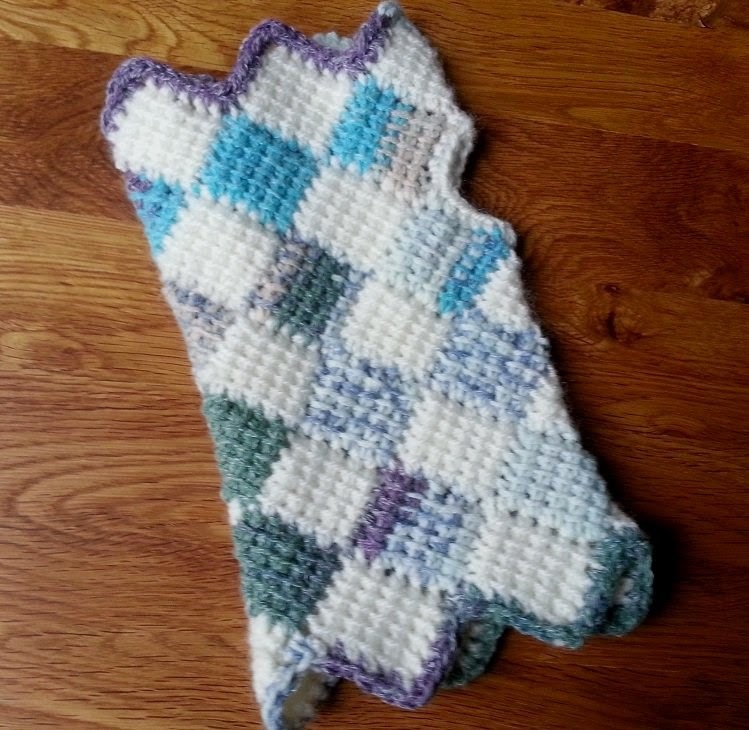 While the weather stays a bit grotty I am going to crack on with mitt number two and start measuring up for my next big project! I am so excited about it, I hope it will end up looking as good as it does in my head! I just LOVE it! 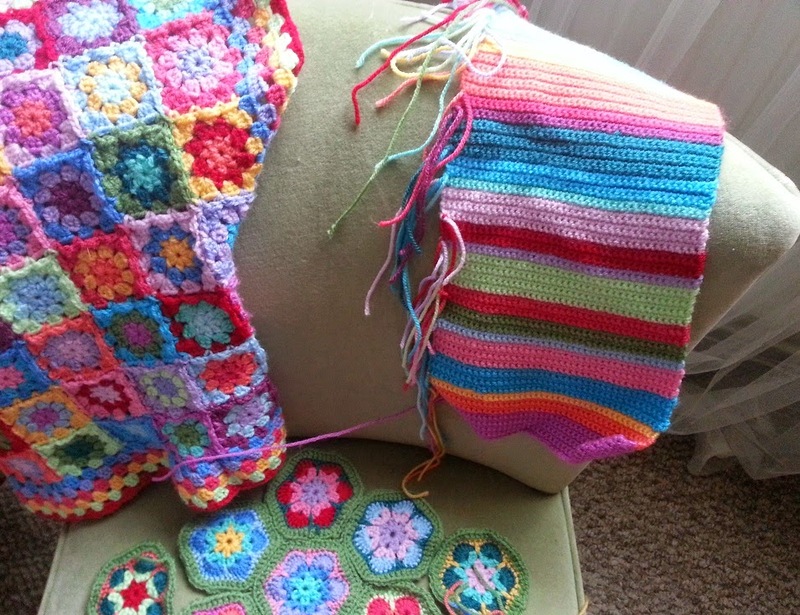 It's so cheery and colourful and the fabric that Tunisian crochet makes is lovely and soft. 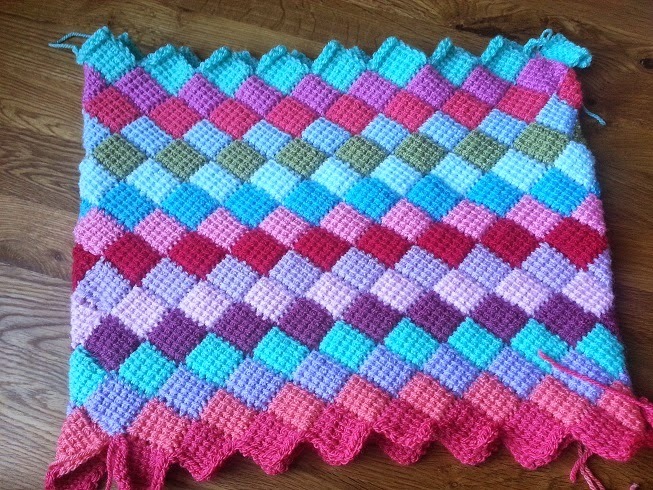 I have been asked for the pattern a few times all ready so I think I will try and write it up so I can share it with you all. It will be my first bash at writing a Tunisian pattern, luckily it is a simple one so I hope not to have too many issues with it. I will of course let you know when it is available. 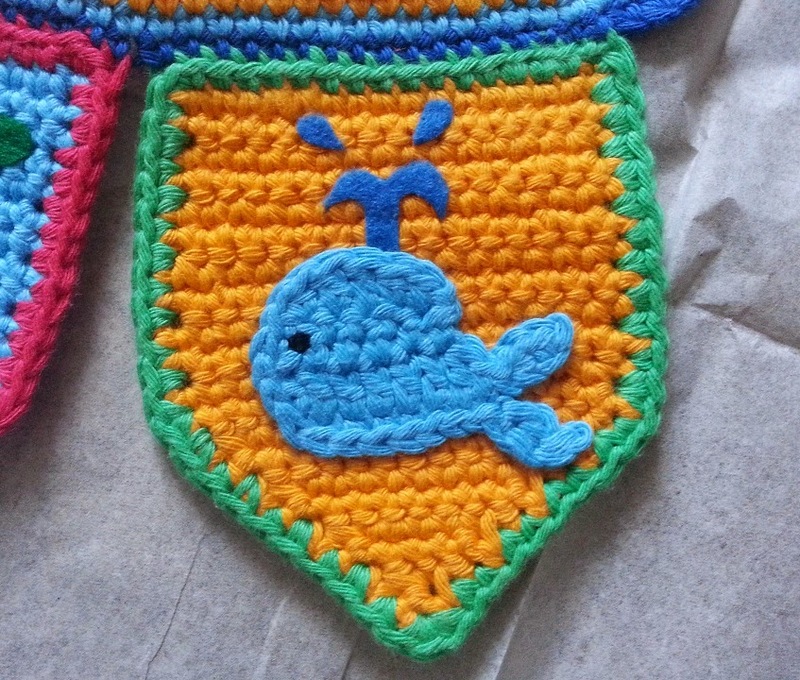 My hook has been very busy today, generally messing around trying to come up with some little applique designs for the baby bunting. So far I have made a hedgehog and a fish, at least I think it is a fish, sometimes it looks more like a three legged octopus! 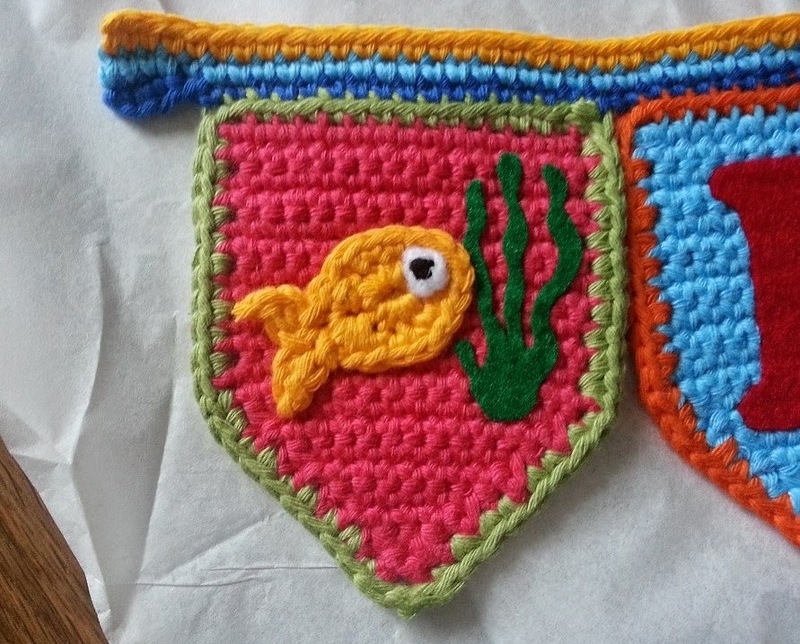 I have cut out some felt to bondaweb on to the bunting as background but I'm still not sure about this fish. 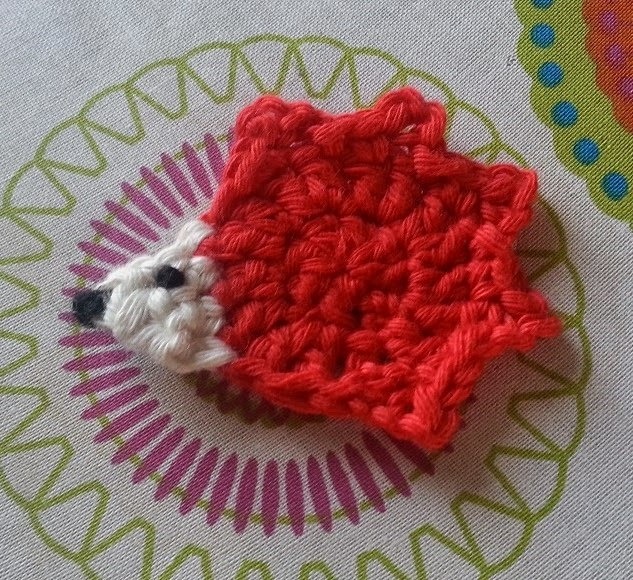 The hedgehog is equally as dubious, it is definitely a hedgehog but I can't decide if he looks right. I've made him some grass to try and animate him a bit more but I'm still not sure. 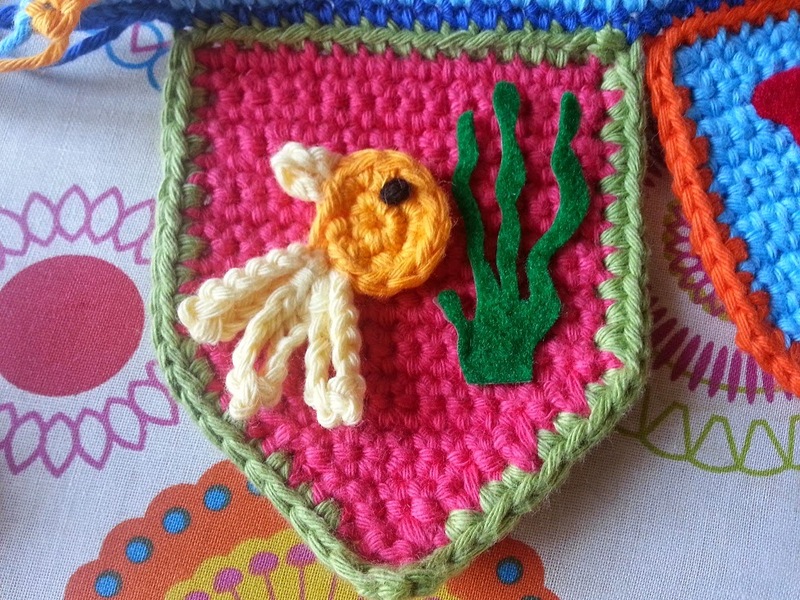 So I am now thinking of other fish I could make and maybe a whale or a bird instead of the hedgehog. 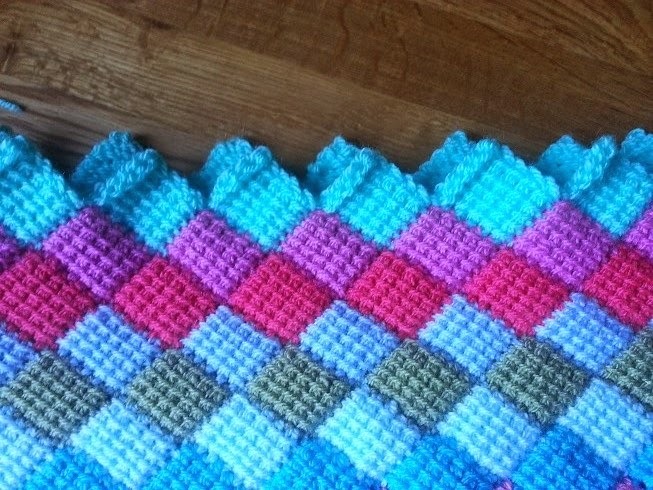 It is such fun messing around like this with no goal other than to make something, anything! 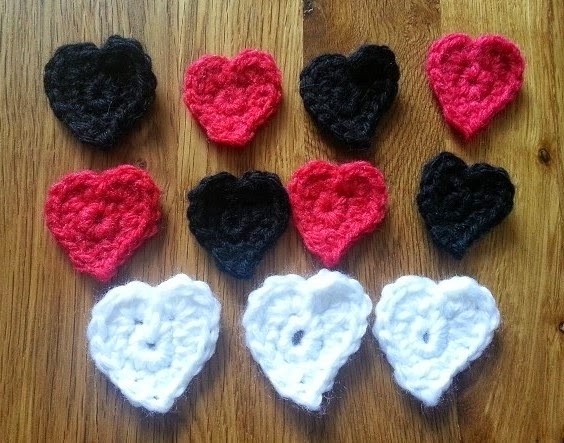 I have also been busy hooking up some dinky hearts for a bit of wedding yarn-bombing for a friend. 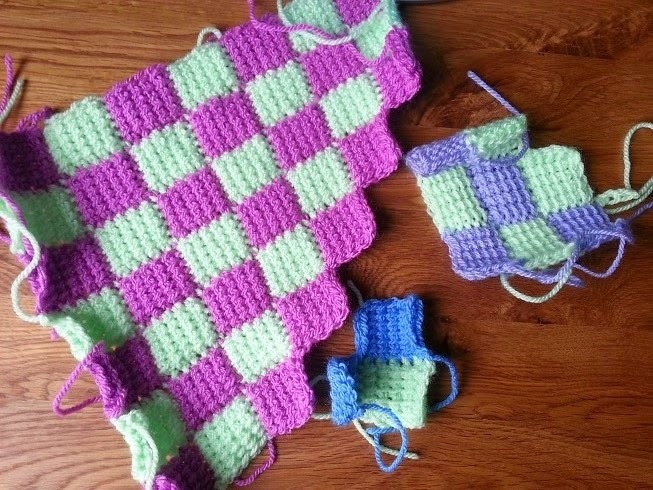 The colours are to go with their scheme and not my usual exuberant mix but I think they look good together. 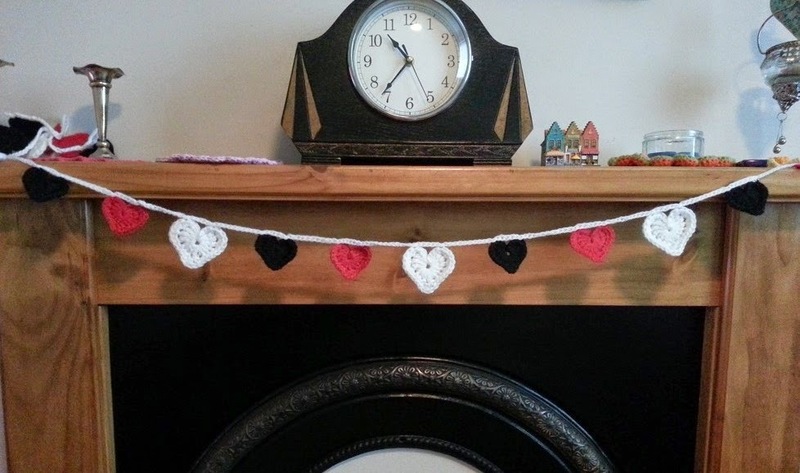 I usually hate crocheting with black yarn, my eyes really don't cope with it too well and it is a bit boring but I am surprised by how effective these little hearts are in black. They might get a bit of button treatment too, I haven't decided yet. 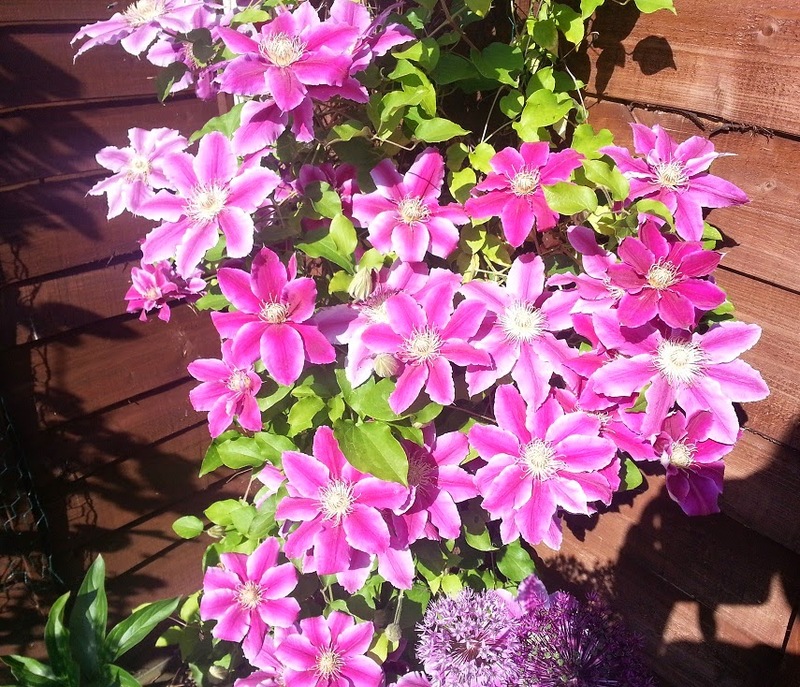 This clematis was another of my rescue-a-plant-from-wilkos efforts and it is really going all out with this big brash flowers this year. OK so it refuses to grow up and over the trellis to hide the nasty wooden fence panel, but it is making up for it's lack of height with a lot of colour. 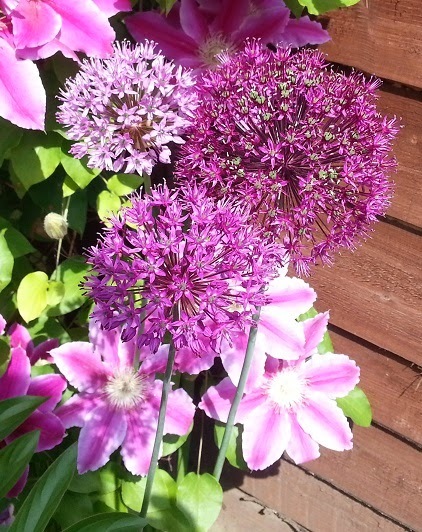 And the aliums I put in last year are looking good too. They were supposed to be red, in hindsight it's probably good that they aren't or they would really clash with the mass of pink behind them. It has been a lovely afternoon pottering about in the sunshine. 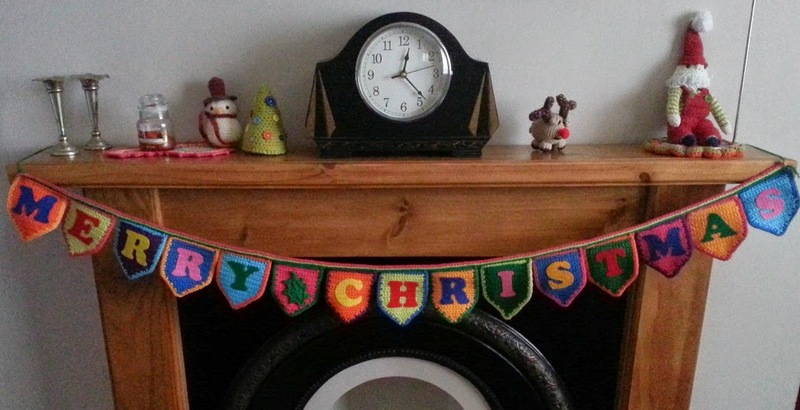 My bunting is finished apart from actually sticking the letters on. It isn't very big, just big enough for the baby's name and a motif or two at either end. 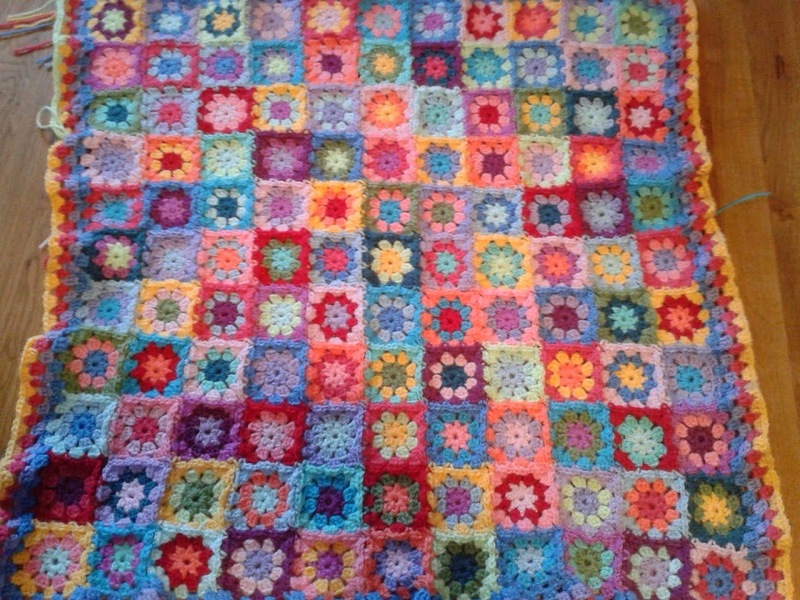 I love the colours (old faithful Rico creative cotton), I do hope they like it too! 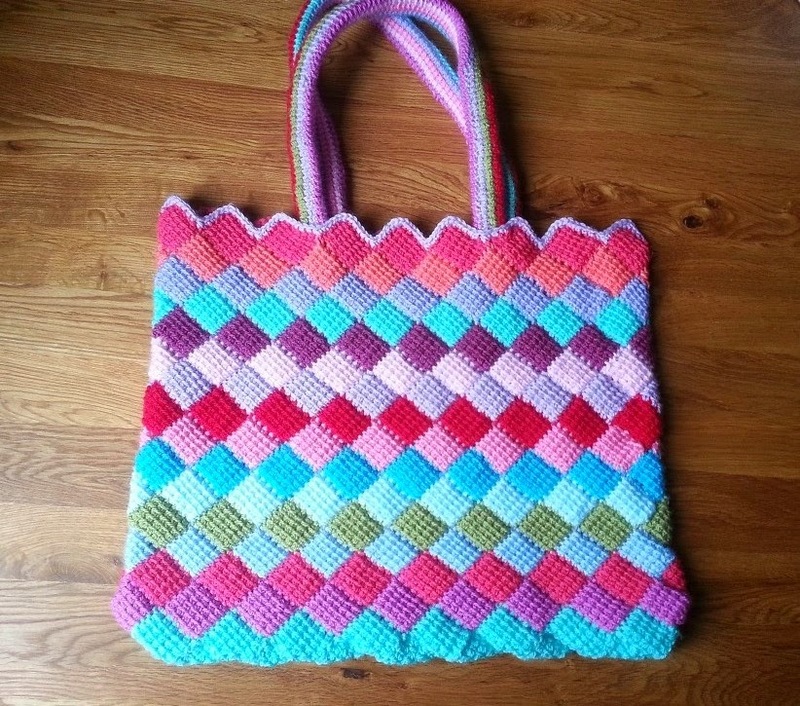 I had hoped to show you my finished Tunisian bag today but I have to confess to a certain amount of dithering, thoughtful dithering but dithering nonetheless. It meets up just fine and I am very happy with how it is coming on, but what to do now? How should I sew the bottom up? Should I stick to my original idea of a tote bag and just sew it flat (but then what to do about the corners?) or make it a round bag and hook up a big flat circle for the bottom? But then what about the top? Should I leave it all zig-zaggy or square it off? If I do that how am I going to do it? Should I edge it with a pretty frill or a plain stripe or not at all? If all that wasn't dithery enough, what about the handles? 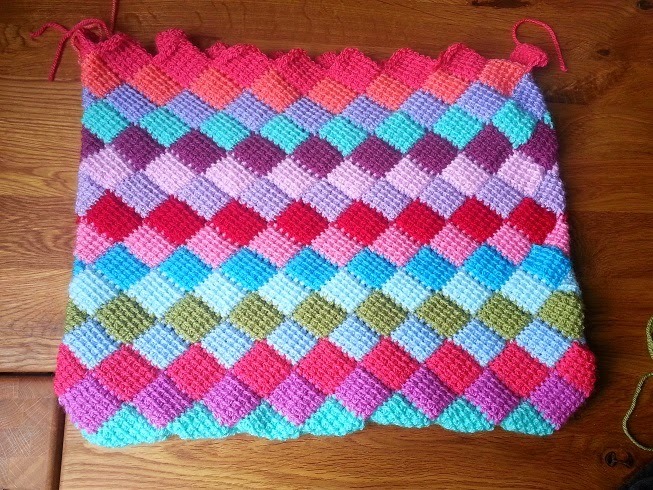 I want long handles so I can sling it over my shoulder, do I do this in normal double crochet or go for the full Tunisian effect? 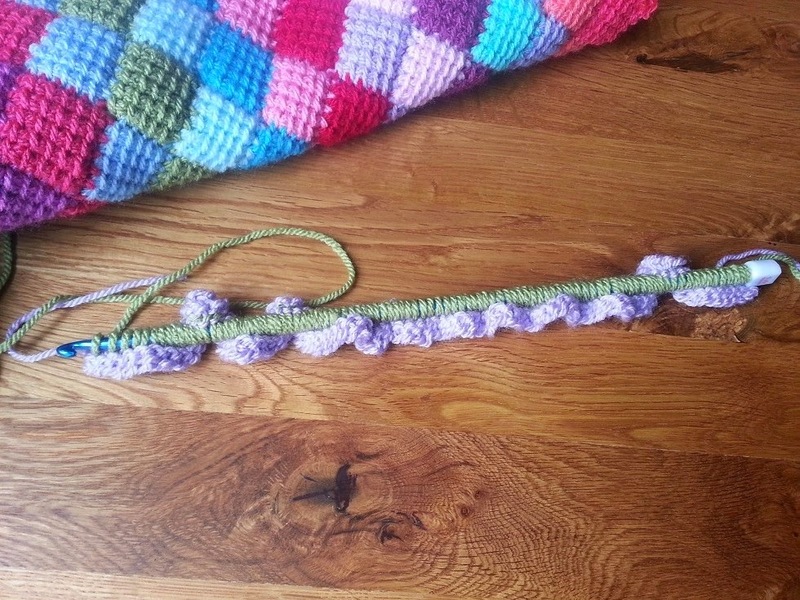 I decided on the latter and this morning found my 5mm Tunisian hook, made a chain of 100 stitches and set to making handle number one. 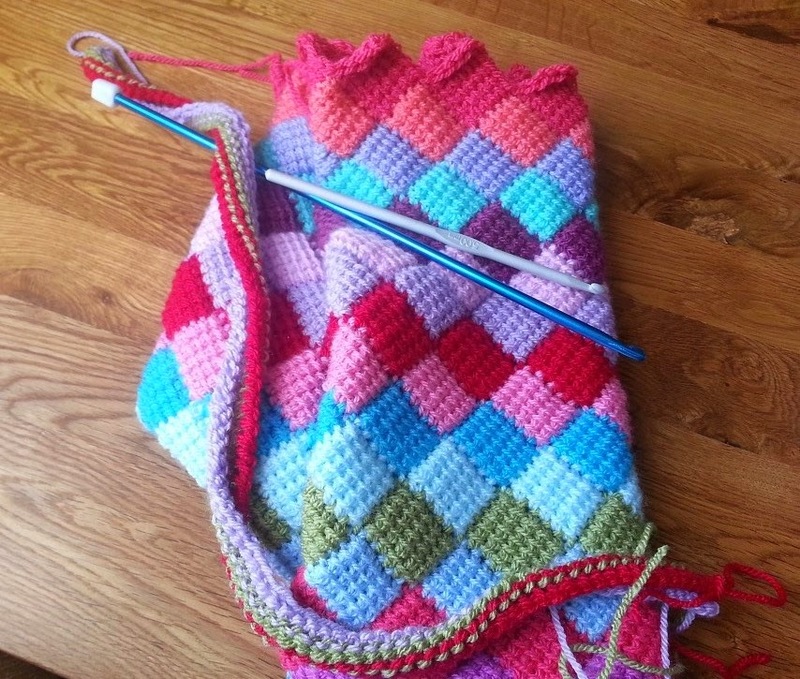 This seems to be a very quick way of doing it but Tunisian crochet does have a tendency to curl so I will have to make them wider than needed then fold them back to make a tube for added strength. 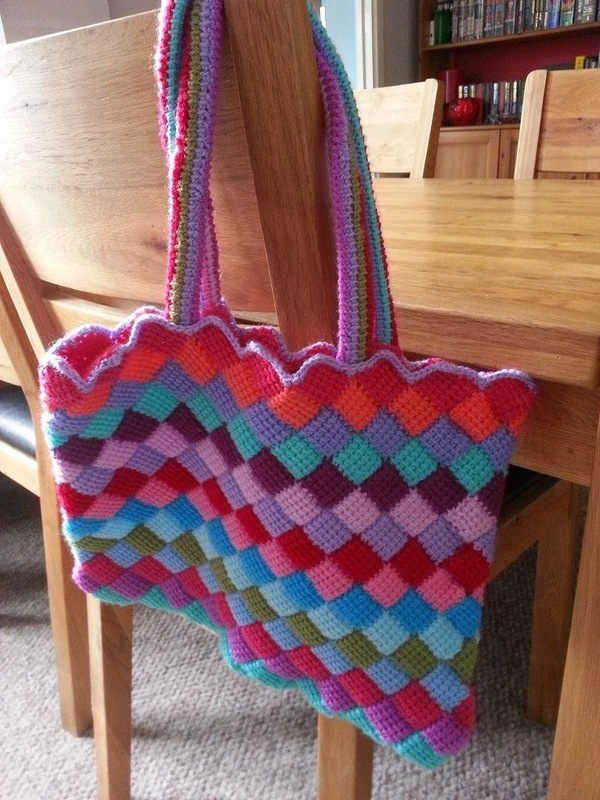 So I think I am getting there, the bag is taking shape and it is so much fun trying out this new way of crocheting. I have decided on one thing which is that I can do all these things this evening when the good daylight has gone and my afternoon shall be spent doing something a bit more intricate. 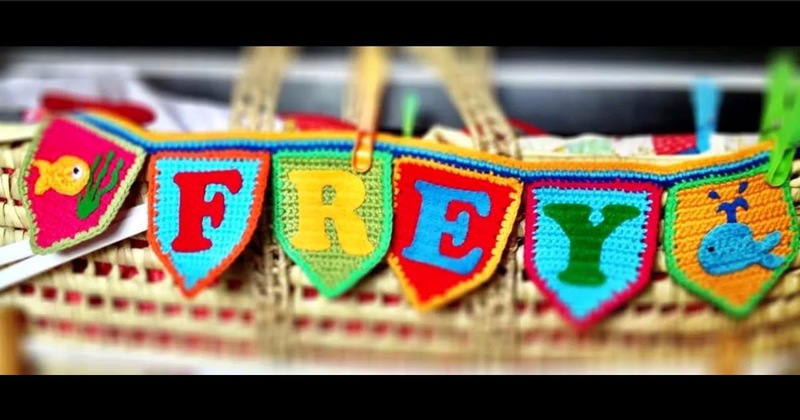 I have an idea for some bunting for a friend who has just had a baby. 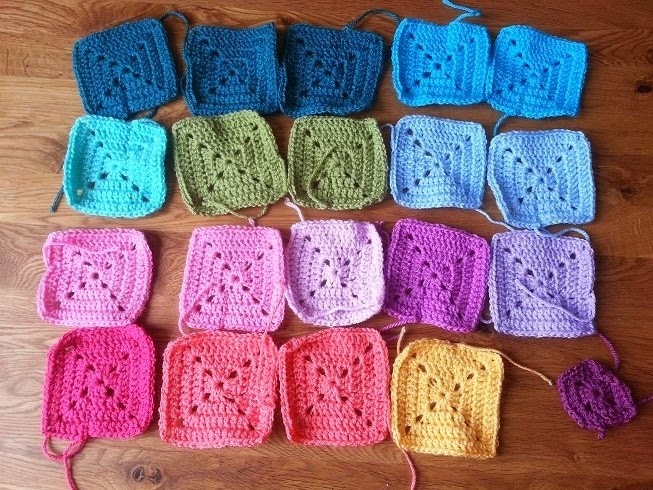 It will be along the same lines as my Christmas bunting (pattern by Lucy at Attic24), which while being festive isn't all reds and greens so this will be suitable for all the year long hopefully.